A new design in ticket redemption. Shooting Mania is a skill-based redemption game and features many feature games with full of fun. Three players unit with friendly control interface. 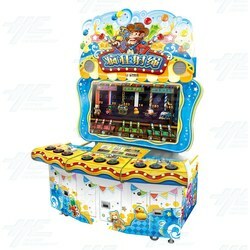 This machine features a colourful cabinet and the aim of the game is to aim at ropes and shoot them down. Shoot and explode balloon to win tickets or shoot the rope to randomly trigger LUCKY WHEEL. There is a chance to enter the BONUS GAME in LUCKY WHEEL.